Fibers Question: What Is Batik? Batik is a method of dyeing fabrics and sometimes paper in which some areas are covered with wax, glues, or specially made products to keep dyes from penetrating the fabric. Typically the wax or other product is laid down in a pattern and then the paint is applied and allowed to dry. The wax is then removed. The area under the wax keeps its original color with an occasional line of color giving it a somewhat crackled look. Traditionally, wax is used as the batik medium, however, if you are working with children, we would suggest experimenting with plain, white school glue instead of wax since wax must be hot to be applied and then hot again to be removed. You can apply white school glue in a pattern, allow it to dry, and then apply the dye of your choice either with a paintbrush or a spray bottle. Let the dye set for as long as the manufacturer’s directions tell you to, then rinse your fabric in cold water to remove the glue. Set the color as explained by the manufacturer (usually by washing with soap and hot water) and then let dry. You'll be able to make so many amazing different pieces of fabric you can add to fun home decor around the house. Follow these following tutorials for more on how to Batik and design gorgeous fabric! Constellation Wall Art: Make a fun Batik constellation design to hang as art in your home. Find a simple frame and it's a gorgeous piece to add to any room in your house. How-to Design Batik: Follow these patterns for a fun Batik look. You can make so many different things once you've made your cool new fabric. Super Easy No-Wax Batik: We love how this beautiful design turned out using a no-wax method for Batik! 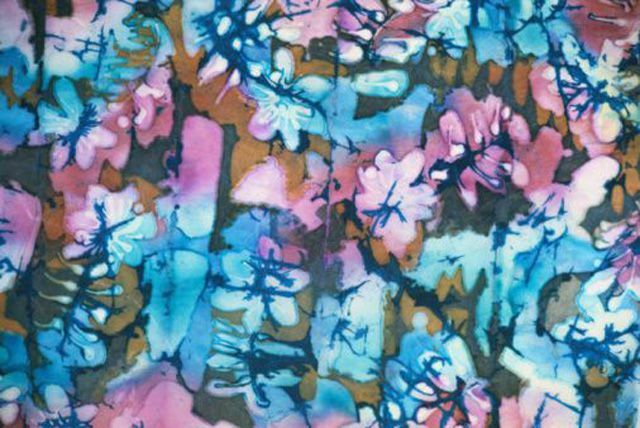 Glue-Resist Batik: How cool did these turn out? We love this simple method for designing your Batik fabric. Kid Friendly Batik: This is a great no-wax Batik method where you use blue glue to make your amazing Batik designs!